Quick warning: major rant on zoos and pandas incoming. Proceed with caution and at your own risk. I claim no liability for any injured feelings towards pandas or shattering of childhood visits to zoos (including my own). As a kid, I always enjoyed going to zoos and aquariums. I lived 15 minutes away from Maritime Aquarium and maybe an hour and a half from the Bronx Zoo (I think), where my childhood friend’s dad worked. I grew up reading (children’s) encyclopedias alongside children’s picture books and novels. Animal Planet and Discovery Channel probably got as much or more air time in our living room as channels like Cartoon Network or Nickelodeon. In short, seeing and learning about animals in these various contexts was probably what drove me to be interested in biology, ecology, and especially marine biology. What’s the first animal you think of when you think zoo? Probably one among the following: pandas, lions, tigers, bears (oh my), giraffes…did I mention pandas? At Ueno Zoo, the giant panda exhibit is pretty much the first right out of the gates–and it all started with a hastily arranged visit and gift of two pandas from China to Japan (after Nixon’s surprise visit to China where he returned with two pandas and which left Japan scrambling to follow suit). People line up in one of two lines for a close or slightly further away view of the panda (naturally, not the ones originally gifted by China), sitting in a glass and walled enclosure munching away at bamboo. I’ll be honest. 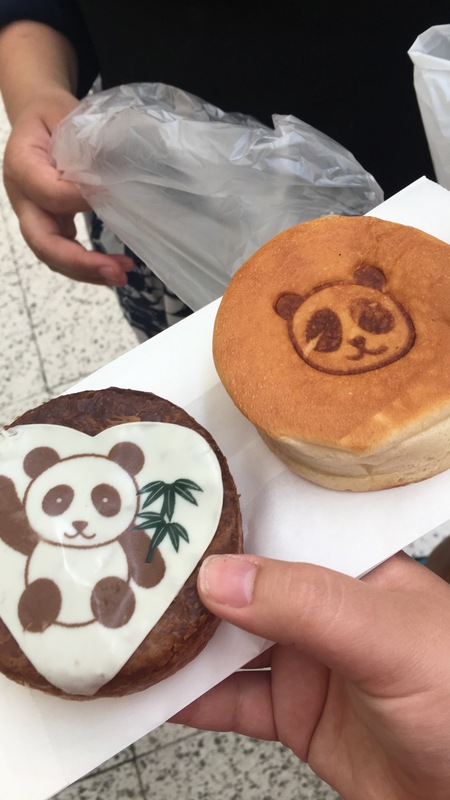 Amidst all the “oohs,” “ahhs,” and “kawaii ne” (cute), I’m not particularly moved by pandas. Or typically “cute” things in general. Apparently, according to Lorenz, pandas and certain other animals evoke this affectionate response not just culturally (and commercially), but also biologically/evolutionarily. We’re conditioned to respond to animals with certain head, face, and eye shapes and proportions, so that we’ll be more likely to care for our own offspring when they’re perhaps most vulnerable. So yes. We associate pandas with babies. Supposedly also, there’s just something peaceful and relaxing about how they just sit around. When the two pandas were delivered to Ueno Zoo from China, the Mainichi Shinbun reported after about 3 days of exhibition (and let me grab the exact quote because it riled me so much), “After trying to please everyone for several days in a row, the pandas at the Ueno Zoo, Kang Kang and Lan Lan, have crashed from too much work.” Absolutely infuriating. Anyone who knows me knows that I don’t really get riled at very many things. This is one of them. So often, we attribute human qualities to animals that I don’t think we have any business doing. The pandas are hardly “trying to please” people, nor are zoo or aquarium (read as: SeaWorld) animals consciously trying to serve people by being there. We tend to anthropomorphize animals. There was a sign next to the panda display saying “Look it stood up!” and some text about it getting exercise; I interpreted it as a nod towards seeing pandas as babies and the monumental moment in life when a baby first stands. Either way, it’s assigning human attributes to the panda. I’m conflicted, though. On the one hand, I think it’s absurd to ascribe human characteristics, emotions, and values to organisms. But on the other hand, is this what is needed to protect them? That is, I’d always believed that if you can get people interested in the environment and wildlife, interested enough to want to protect them, then maybe you have a shot at conservation en masse. And what better way to do so by getting them fascinated at an early age at places like zoos and aquariums. So all the “oohs” and “ahhs” evoked by pandas and polar bears (it drew a huge reaction when it lifted its head briefly) and these other “charismatic megafauna” maybe is how you get people to care for the environment. But even then, the problem with that is that you don’t focus on all the myriad other organisms on this planet. Heck, as I write this, some obscure, unknown species may well have gone extinct. People won’t care about the insects, the microorganisms, all the wonderful diversity that makes up this planet. Because they aren’t cute. Or majestic. Umbrella species can only protect from so much raining extinction. I want to rant about one last thing. From what I’ve seen, zoos enclosures are incredibly unrealistic. I’m not really speaking from a “public immersion” perspective. Rather, zoo enclosures seem horribly ill-suited for their occupants. Polar bears lay in the shade in an open air exhibit filled with plexiglas rocks and ice and concrete walkways. Hawks and eagles and owls perch in caged enclosures that seem hardly adequate for these soaring birds. I can only hope that Tokyo Sea Life Park on Tuesday offers more realistic, “natural” environments for its inhabitants. Otherwise, I’m starting to have trouble justifying the enclosure of animals in these artificial, inadequate environments. If zoos and aquariums are meant to show people a glimpse of this “separate” (an association I also disagree with, but [panda] bear with me) or different natural environment, they should at least try to make them as realistic and natural as possible. For our sake as viewers and for the animals’ sake. Haven’t been to zoos since the age of three, today I visited Ueno Zoo and got to see the giant pandas from China for the first time. However, my first 出会い with a giant panda was incredibly short: we were pushed through a path five meters away from the room the panda Li Li stayed in and had less than five minutes to take a good look. My only reaction was to take a bunch of pictures, with Li Li barely visible behind people on the closer path to the panda house. 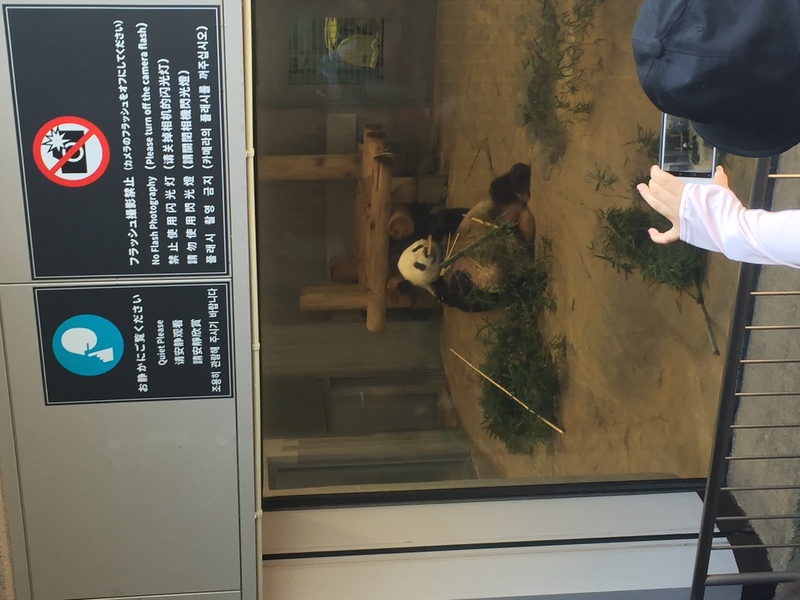 I was disappointed because completely different from my typical impression of pandas eating bamboos in the woods, this panda was restricted in a small room by himself, sitting on the floor eating bamboos. Li Li was the only panda on display today, so the other display rooms marked with the panda’s names were closed. At the end of all the panda rooms was a small space that was supposed to mimic pandas’ natural habitat, and (maybe) because it was too hot, no panda was staying there. The panda section, as well as most of the other sections, looked like a prison to me: they were constantly watched and annoyed by visitors and children, and their schedule was oriented at the need of visitors. For example, at the tiger section, the food was placed right in front of a big piece of glass where people had been eagerly waiting, like predators waiting for their prey. 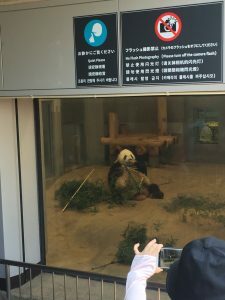 Although visiting a zoo is 久しぶり for me, this visit still turned out to be depressing. Separated by the thick glass or cage, the animals are not only captured but also made into an anthropocentric exhibition of endangered species, taking a narrative of pure human interest. The slogans such as パンダの夢 and posters educating children about the importance of protecting tigers are incredibly ignorant of the fact that the environmental problems now are not just about protecting several species but the whole ecosystem viewing nature as a whole rather than disjoint parts. When the Ueno Zoo was first built, it was created in order to show Japan’s modernity taking the Western standards. Although now the zoo has (or appears to have) turned to the direction of educating about environmental preservation, the choices of what animals to include and what not to were made by the human. In the case of Japan, the choices are largely based on the cuteness and popularity of the animal, as well as political significance. Animals are never created equal, and neither are animals in the zoos. To end this post, I would like to think about a recent genre of animation movies about animals escaping of the zoos/aquariums and making their own lives. What does that have to do with the problems zoos are having now? How should we make of it? In an animation movie about animals escaping the zoo and finally returning to the zoo and becoming star performers (I forgot the name..残念), the animal’s returning is a strong implication of human power over nature; although animals are depicted as smart and kind and humans dumb and evil, the fact that the movie creates a binary of animals v. human is an act of establishing human power as superior to nature.